Throughout the Halloween season, Comet Over Hollywood is spotlighting Halloween episodes of classic television shows. Ricky Nelson in his skeleton costume. “My skeleton costume makes me look real thin and people feel sorry for you and give you more cake and ice cream,” Ricky said. Ricky’s brother David comes home with a box of Halloween goodies and decorations. He’s the class treasurer and just bought everything for a school Halloween party. This week, Comet Over Hollywood is celebrating Halloween with slightly more offbeat horror films. Young witch Mildred Hubble (Balk) is in her first semester at Miss Cackle’s (Rae) Academy for Witches. The clumsy young witch means well, but constantly is getting into mischief as she makes mistakes or accidentally creates mishaps. Some of her mistakes include making herself invisible instead of creating a laughing potion or turning her mean classmate Ethel (Kipling) into a pig. When all of the other girls are given black witches kittens, Mildred even ends up with a grey and white tabby. Her stern teacher Miss Hardbroom (Rigg) thinks Mildred isn’t trying hard enough and creates the messes on purpose. While Mildred is suffering from her mishaps, Miss Cackle’s evil twin sister Aggie (also Rae), is plotting to take over the school and make the students evil witches. When it is announced the Grand Wizard (Curry) is coming to the school for the Halloween celebration, Mildred practices hard so she can be in the flying broomstick presentation. But stuck-up Ethel works to sabotage her and get Mildred expelled. 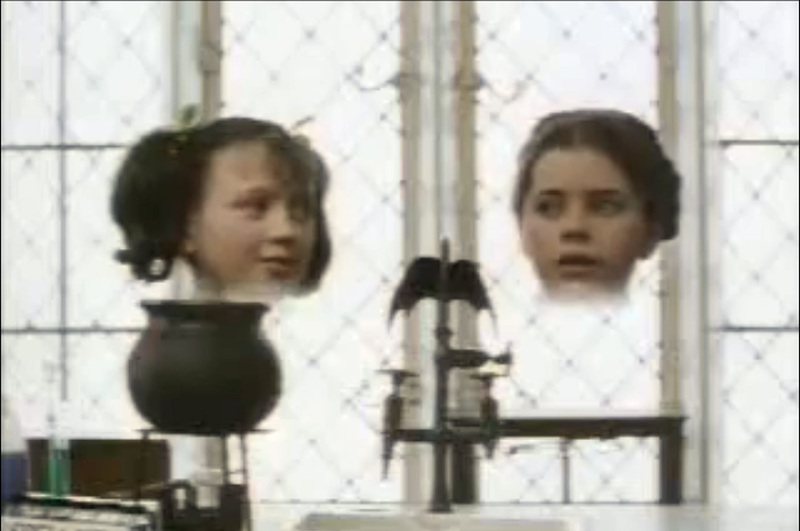 Worst witch Mildred Hubbel (right) makes she and her friend Maud disappear when she makes a mistake with a laughing potion. -Originally aired on Nov. 1, 1986, on HBO. -Based off the children’s books series by Jill Murphey. Murphey adapted the stories from her own experiences at school- changing chemistry to potions or singing to chanting. -A UK television show was made using the story and ran from 1998 to 2001. -One of the writers of the script or the original story must have been a fan of bandleader Kay Kyser. One of the spells starts with “Ish Kabbible” which is the name of one of Kyser’s popular band mates. 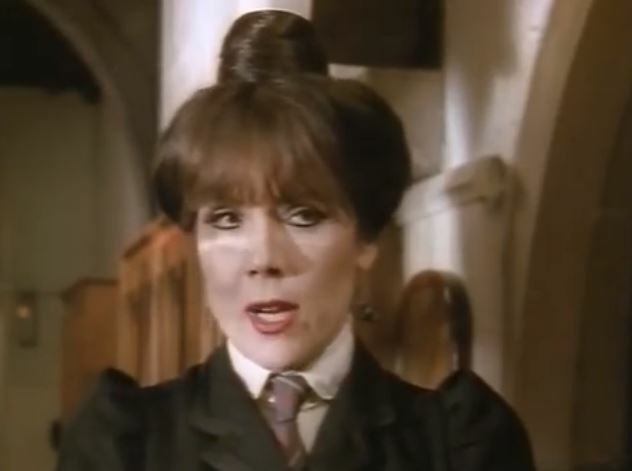 Diana Rigg as Miss Hardbroom. Miss Cackle’s evil twin Aggie, also played by Charlotte Rae. I know, this is not your sparkling, Hollywood, Freed-unit movie musical, but I thought I would throw a bit of nostalgia your way for Halloween. 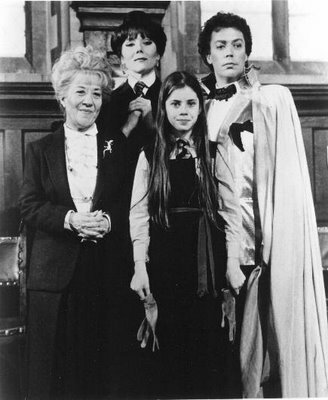 I don’t know about you, but I remember watching “The Worst Witch” on the Disney channel when it would air around Halloween. Revisiting the hour long TV special for Musical Monday brought back some fond memories. “The Worst Witch” truly is delightful. Admittedly, it’s not the best script you will ever read and the songs are very silly, but it is so much fun. The child actresses do a fairly good job (though they are frequently whiny), and the snobbish bully plays a character that is easy to dislike. 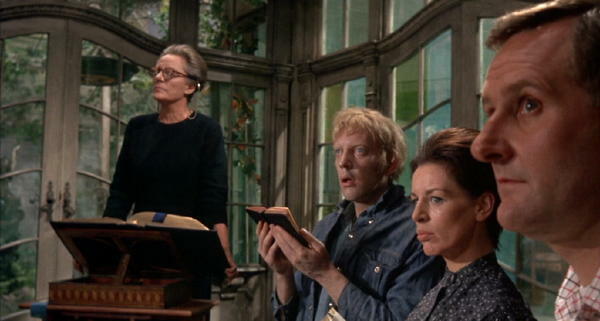 Diana Rigg does a wonderful job playing the hard, stern teacher with a beautifully deep voice. Twenty years after her “Avengers” days, she is (of course) still looking beautiful, even in a witch’s get-up. 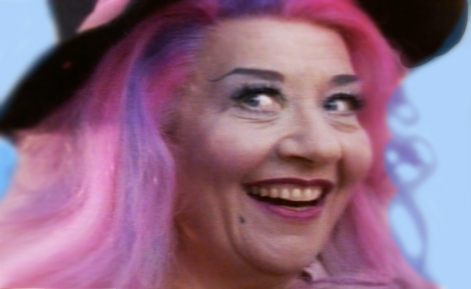 And Charlotte Rae is so much fun in her dual role– one a proper English headmistress of the Witch Academy and the other, an evil redneck witch with a Southern accent. 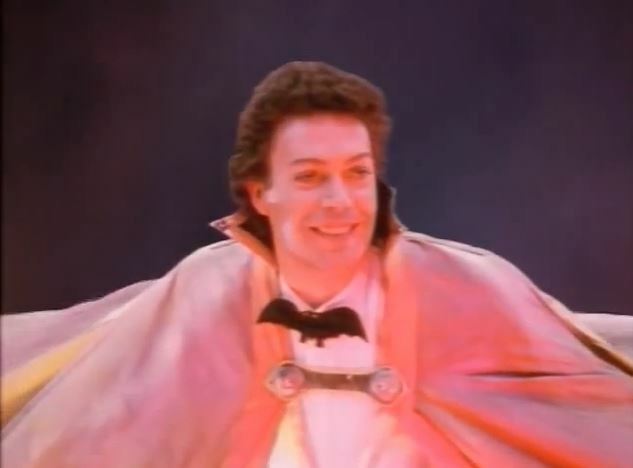 But of course, though his role was maybe 10 minutes, Tim Curry’s random but memorable appearance is my favorite performance. Curry’s brief performance is just so deliciously campy that I couldn’t help giggle the whole time. “The Worst Witch” is only an hour long and a cute story to accompany your Halloween. Tim Curry plays the Grand Wizard. Starting in the 1960s with Bette Davis and Joan Crawford in “Whatever Happened to Baby Jane?” (1962), famous actresses of the 1930s and 1940s who were now “past their prime” were cast in semi-campy horror roles. Actress Tallulah Bankhead’s last film happened to be one of these horror films. Made in the UK under the title “Fanatic” and called “Die! Die! My Darling! 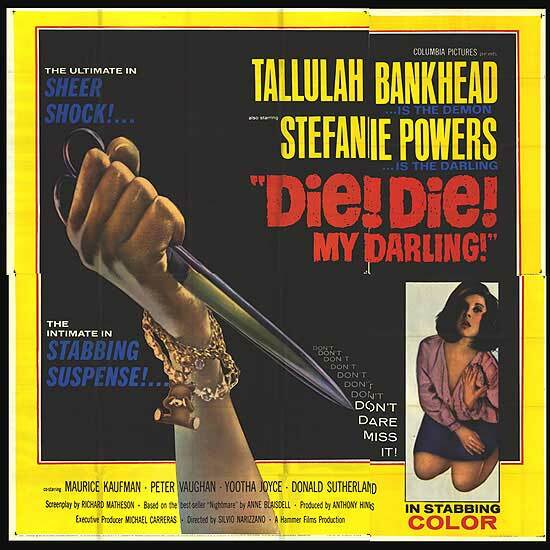 (1965) in the United States, actress Stefanie Powers co-stars with Bankhead. Directed by Silvio Narizzano, Bankhead plays Mrs. Trefolie whose son Steven died tragically. At the time of his death, Steven was engaged to Patricia Carroll, played by Stefanie Powers, but Patricia intended on breaking off the engagement. Patricia kept correspondence with Mrs. Trefolie and decides to pay her a visit at her secluded home while she is in England with her fiancé Alan, played by Maurice Kaufmann. Alan warns her not to go alone, but Patricia doesn’t listen. What Patricia plans to be a four-hour visit turns into several days trapped in Mrs. Trefolie’s home. Mrs. Trefolie is obsessed with her son and is fanatically religious. For example, Trefolie insists Patricia stays until the next morning for a private church service at home which lasts 12 hours. When Mrs. Trefoile notices a lipstick stain on Patricia’s glass, she is told to wash her makeup off. There also aren’t any mirrors in the house because they encourage vanity and sensuality. Patricia is told to change immediately when she is wearing a red sweater, because it is the “Devil’s color.” Mrs. Trefoile believes that Patricia is her daughter-in-law, because she qualifies the engagement to Steven as marriage. In her religious beliefs, Mrs. Trefoile says Patricia could never remarry, even with a dead husband, because it is against God’s will and she is eternally wedded to Steven….though they never were married. Mrs. Trefoile also refuses to go to a local church, because the pastor remarried after his wife died several years before, believing he is forever married to the first woman. When Mrs. Trefoile finds out Patricia is newly engaged and was planning to breakup with Steven before his death, she blames Patricia for Steven’s death, saying she killed him, and locks her in the house. Helping the elderly woman through all of this are her two servants, who hope to inherent her money. By depriving Patricia of food and locking her away in solitude, Mrs. Trefoile says she is trying to “cleanse Patricia’s soul.” This includes interrogating Patricia about her virginity and tearing up all of her beautiful clothing and jewelry. Mrs. Trefoile believes she hears her son tell her to murder Patricia, and she sets out to do so. 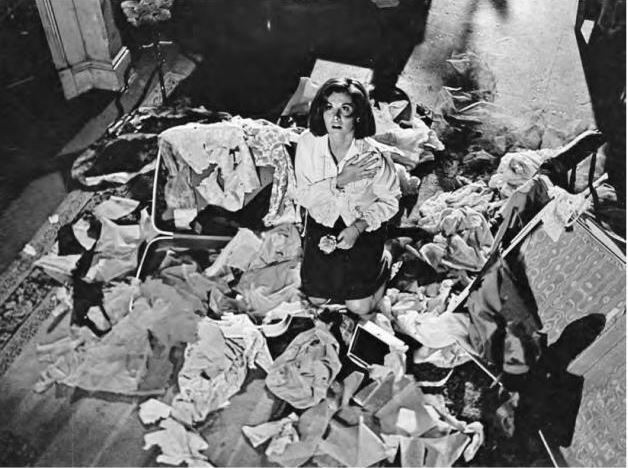 Stefanie Powers’ clothes destroyed by Mrs. Trefoile and her maid, Kate. Not only is “Die! Die! My Darling!” Bankhead’s last film, but also her first horror movie, according to the LIFE magazine article, “One Old Trouper Comes Back” by Conrad Knickerbocker. The film is based off the novel “Nightmare” by Anne Blaisdell. The English horror movie is enjoyable. 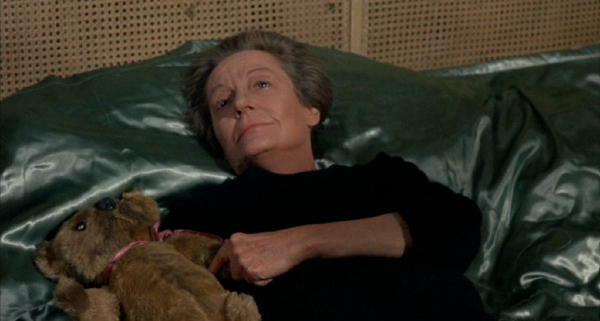 I thought the religious fanaticism added a level of intrigue, depth and craze to Bankhead’s character, rather than the usual overbearing mother role. Mrs. Trefoile’s obsession with her dead son is exhibited by believing that his soul is in the house and responding to her, his photos everywhere and cuddling his teddy bear as she sleeps. Admittedly, I was rather frustrated while watching “Die! Die! 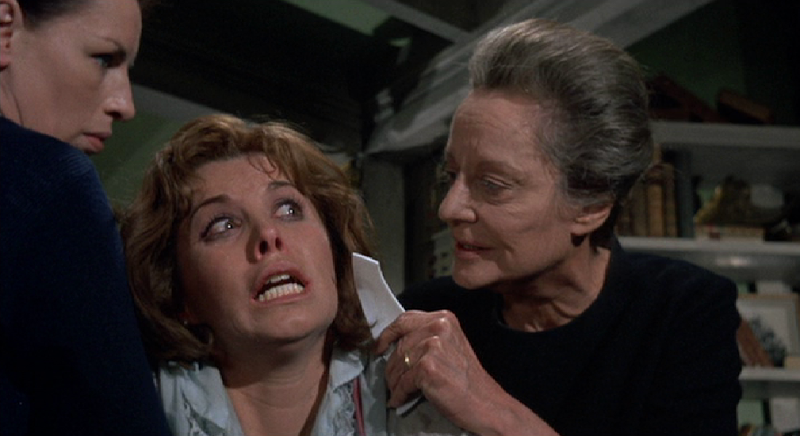 My Darling!” There are several moments where you think Stefanie Powers can overtake this rickety old woman who keeping her captive, but she flails around and fails. Mrs. Trefoile threatens to cut Patricia’s face so she will no longer be attractive to men. Maid Kate holds Patricia so she can’t escape. Powers’ character had a sharp tongue but was too weak and uncoordinated to fight Bankhead’s character alone, and this frustrated me greatly. However, while I was frustrated with Powers in the film, I realized that was how her character was written in the script. Another odd thing about “Die! Die! My Darling!” was the music. For the first half of the movie, the soundtrack was quirky and almost comedic harpsichord music. The music could be comparable to the 1960s English TV show “The Avengers,” starring Diana Rigg. However, as the cat-and-mouse torture between Powers and Bankhead escalated, the music became more serious and exciting. Mrs. Trefoile talks to her dead son while holding his Teddy bear. I believe my favorite character in the film was 30-year-old actor Donald Sutherland in one of his first film roles. Sutherland played a worker at Mrs. Trefoile’s home who had special needs. I was a little disappointed he wasn’t in the film more, and his character wasn’t given much of a purpose. “Die! Die! My Darling!” is a little more quirky and humorous than other horror movies starring actresses like Joan Crawford or Bette Davis. However, while I wouldn’t rank the film higher than “Whatever Happened to Baby Jane?” (1962), “Hush, Hush Sweet Charlotte” (1964) or “Strait-Jacket” (1964), the cat and mouse interactions between Bankhead and Powers were intriguing and made for an enjoyable Friday evening film. Sidenote: When I watched this movie with my parents, my Dad said all he could think about was the Metallica song “Die, Die, My Darling.” The song “Die, Die, My Darling” was originally written by The Misfits and later covered by Metallica. Happy Halloween from Comet Over Hollywood! -And I sing a little for you! 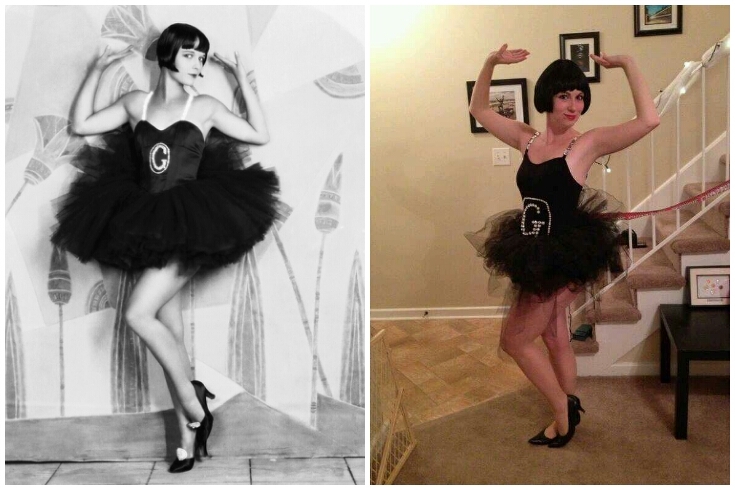 Did you dress up as anything classic film related this year? Be sure to e-mail me your photos at cometoverhollywood@gmail.com and I will help you show them off on Comet! The difficult thing about being a classic film lover at Halloween is no one knows who you are supposed to be. Some of you might remember my Carmen Miranda costume from last Halloween. Several of my friends thought I was Chiquita Banana and I tried to correct them-Carmen Miranda was spoofed so many times by Bugs Bunny and Daffy Duck that surely they would know. This year I decided to be Cyd Charisse in the “Girl Hunt” number from “The Band Wagon” (1953). I knew most people might now know who I was so I said “someone from an old musical” and elaborate if they liked classic film. I guess this is a rather odd choice for a Halloween costume, but I had an old red sequined dance costume that would be prefect. All I had to do was go to Hobby Lobby, buy some similar colored material and sew it on. For not having a full length mirror as a reference, I was pretty pleased. I can’t wait to see the photos of any other classic film costumes!! Halloween 2011: Cyd Charisse from the "Girl Hunt" number in "Band Wagon"
P.S) I apologize for my blogging absence, still no internet in my apartment so using my work computer and free Wi-Fi at McDonalds. I miss reading everybody’s blogs! We have October’s installment of classic film referenced or shown in music videos. This month I’m spot lighting the 1997 Backstreet Boy’s video “Everybody (Backstreet’s Back). -Kevin is Two-Faced which is supposed to be Dr. Jekyll and Mr. Hyde- Frederic March or Spencer Tracey anyone? It’s highly possible the Backstreet Boys are not familiar with any of the classic films I mentioned above but those are the films I thought of while watching the video-probably because classic film is pretty much on my mind all the time. Hopefully you just don’t ban Comet Over Hollywood if you were more of an N’Sync fan! This is also just a cheesy little video just in time for Halloween. And hey, maybe it will remind you of your youth (I was in third grade when this came out). Enjoy!